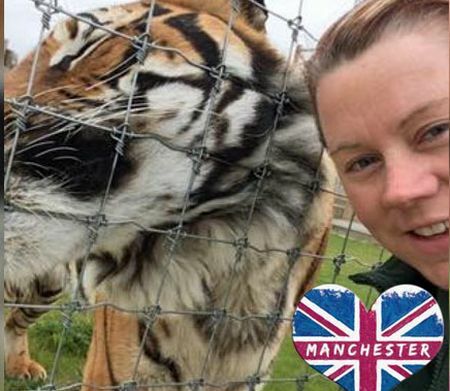 A female zookeeper was killed on Monday by a tiger at Hamerton Zoo in the county of Cambridgeshire, about 80 miles north of London. More than 100 visitors were evacuated from Hamerton Zoo in Cambridgeshire as ‘all hell broke loose’ and police and paramedics rushed to the scene. Witness Pete Davis said he believed King was attacked after rushing to help a colleague in the tiger enclosure. He said: “There’s no doubting it was a girl’s scream and something terrible had happened. It sounds like a tiger turned on her. She had run into the enclosure after hearing one of her colleagues shouting and moments later all hell let loose. She let out a blood-curdling scream and then another keeper ran out and shouted “run”. Hamerton Zoo Park released a statement, describing the death as a “freak accident”. “At no point during the incident did any animals escape their enclosures, and at no point was public safety affected in any way,” the zoo said. The zoo said staff were “too distressed” to speak to the media directly, but a “full investigation” into the incident was underway. Did Harambe have to die?